Now that I am on the team, my official duties start in January (which is tomorrow), but I really wanted to get December's challenge done too. It really appealed, I think it was the map thing. So, I created a page more about the idea of traveling rather than a particular destination or trip that I have taken. Now given that I didn't really have any idea of where I was going with the design of this one, I am really pleased with how it turned out. 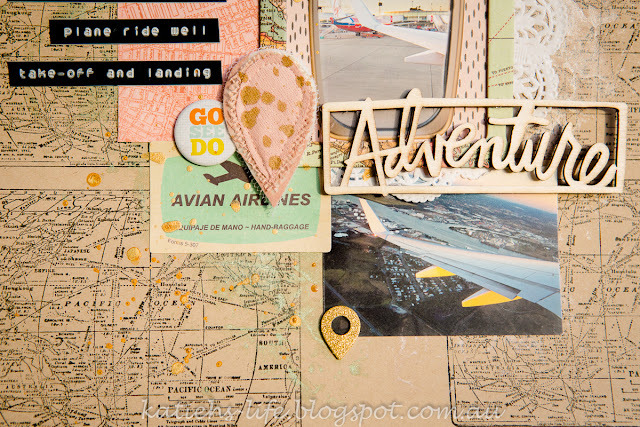 The one thing I did know, was that I wanted to use the world map stamp by Tim Holtz. 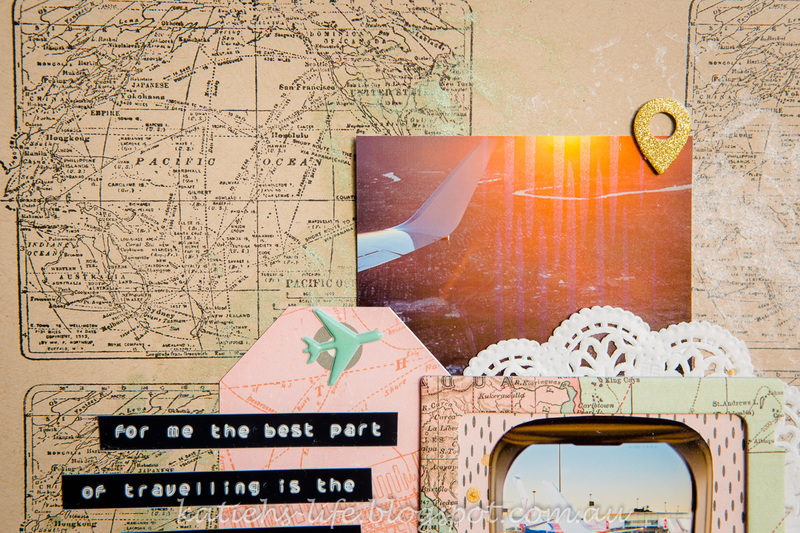 I was amazed at how many little travel themed bits and pieces I had scattered through my stash. I found this cute little puffy plane sticker as well as gold glitter geotags. I even had some old Crate Paper stickers and tags that fitted in perfectly. And one of the DIY Map Markers from Charms Creations was a must have, I coloured this one with blush Colour Shine and splattered with some gold mist. 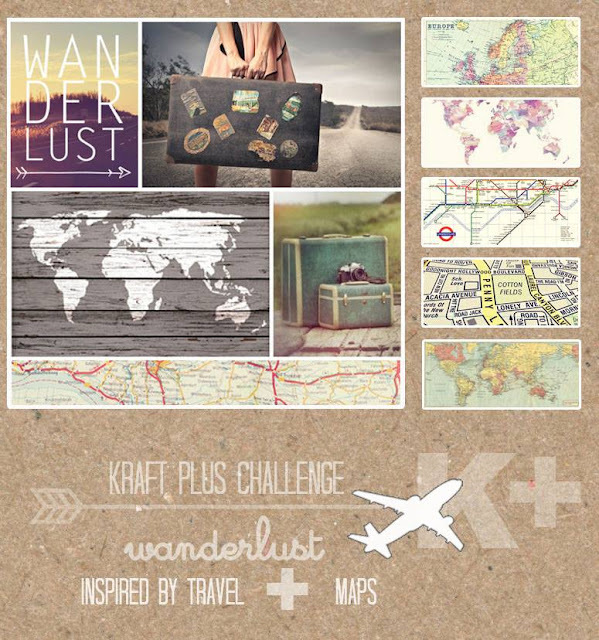 So there you have it, a very last minute page for another cool Kraft + challenge. Make sure you keep an eye out for the new challenge set to go up very soon for January! Thanks for stopping by and Happy New Year to you all! May 2016 be filled with joy and peace for everyone. Snuck this one in, eh??!!!! Love how you've used his map stamp. Looks totally brill & the locator is nice and the flair is even nicer!!! Can I say thanks for sharing with us at K+???!!! LOL...well, I have. So there;)!!! love how the photo just pops. Amazing page! This is great Katie - but you are the opposite of me... really scared of take off and landing! Wonderful use of that stamp! Firstly, welcome to the team :) You certainly snuck this one in...I love it! 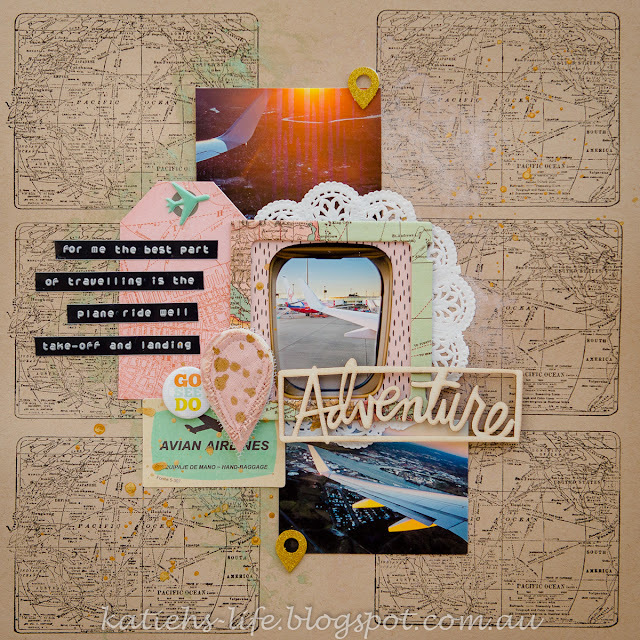 That stamp, so cool...I also love your design with the layering of the photos & embellishments. Thanks for joining us over @ Kraft+...so fabulous to have you part of the team!